Timothy Blankenship wants to be computer technician, but last week a replica of the human arm complete with muscles, bones and nerves really fascinated the teenager. “I love working with computers but this is just as interesting,” said Timothy, a Booker T. Washington High School junior who was among the more than 2,500 Escambia and Santa Rosa county middle and high school students to visit Pensacola State College during the Region 1 SkillsUSA Conference and Worlds of Possibilities Career Expo held Feb. 28-March 1. Pensacola State student Dominic Olivar said the exhibit featuring healthcare programs grabbed the attention of many of the students who meandered through the Worlds of Possibilities expo. The career expo was only a part of the annual conference where nearly 40 Pensacola State students were among the Region 1 winners – many of whom will move on to compete in the SkillsUSA Florida State Leadership and Skills Conference set for April 23-26 in Lakeland, said Jennifer Ponson, the Region 1 director and Pensacola State’s Coordinator of Student and Program Outreach. First place: Team 501 – Jasmine Crane, Ella Peshkova and Desja Ramirez; advisor, Donna Mathias. Booker T. Washington High senior Simiah Johnson has already committed to Pensacola State and said she will join SkillsUSA next fall. “I think it’s a great way to prepare for the real world and learn valuable skills such as interview skills, job preparation techniques and just working as part of the team,” said the 17-year-old who plans to earn a business degree. Navy Federal Credit Union was only one of the many vendors to offer the students hands-on activities. Ferguson Airport featured an R-44 helicopter and pilots who spoke with students about careers and opportunities in aviation, the U.S. Navy’s display included a SideWinder missile, flight instruments, F-14 jet engine turbine blade and more. “The SkillsUSA competitions and Worlds of Opportunities Expo provide effective ways to engage students and prompt them to consider a variety of career choices. 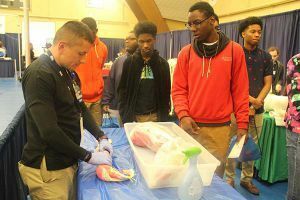 These activities often open doors to future careers for these young people,” explained Jennifer Ponson, Pensacola State’s coordinator of student and program outreach. Gulf Power Co. was the platinum sponsor for the event, along with gold sponsors – FloridaWest, Northwest Florida Manufacturers Council, Aerotek and Navy Federal. Silver sponsors were Central Gulf Industrial Alliance, EREC / Power South Energy Cooperative, Home Builders Association of West Florida, Pensacola Energy, East Hill Building and Design, Ferguson Airport, Highpointe Hotel Corporation, and Technical Training Aids. Bronze sponsors were AppRiver, Baptist Health Care, CES Team One Communications, CareerSafe, D.C. Jaeger, Escambia County School District Workforce Education, Fellows Foundation, George Stone Technical Center, International Brotherhood of Electrical Workers, Locklin Technical Center, U.S. Navy, Santa Rosa County School District Workforce Education, University of West Florida, and West Florida AHEC.